Q1. An article is sold at 22½ % profit. 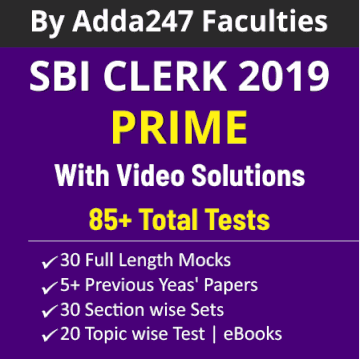 If its cost price is increased by Rs 40 and at the same time if its selling price is also increased by Rs 35, the percentage of profit becomes 15%. Find the cost price. Q2. The age of Ishan is 40% less than that of his sister’s age. Rehan, who is causin of Ishan, is 7/2 years older than Ishan. Rehan’s mother’s age is 150% more than that of him. If average age of all of them is 10 years then what is the age of Ishan’s sister? Q3. How many permutations can be made using the letters of the word ‘BHATNAGAR’ such that ‘N’ always comes in the middle and B and R always come at end places (Repetition of letters is not allowed)? Q4. A, B and C enter into a partnership. A contributes one third of the total capital invested by all, while B contributes as much as A and C together. If the total profit at the end of year is Rs. 84000 then, how much would each receive (in Rs.). Q5. Two pipes A and B together can fill a tank in 20 hours. Ratio of efficiency A and B is 5 : 4. They together filled the tank for the first 4 hours. Then B is closed and another pipe C is opened. Now if tank is filled in another 9 hours then, C alone can fill the tank in how many hours. Directions (6-10): The following bar graph shows the percentage of foreigner tourists of different age group from five different countries who visited the Red fort of India in 2016. The total no. of visitors is also mentioned with each country. Study the bar graph carefully to answer the questions that follow. Q6. Find the average no. 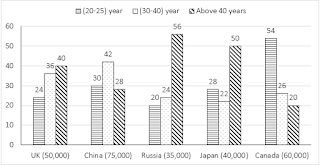 foreigner tourists of age groups (30-40) years from all countries together. Q7. Total no. 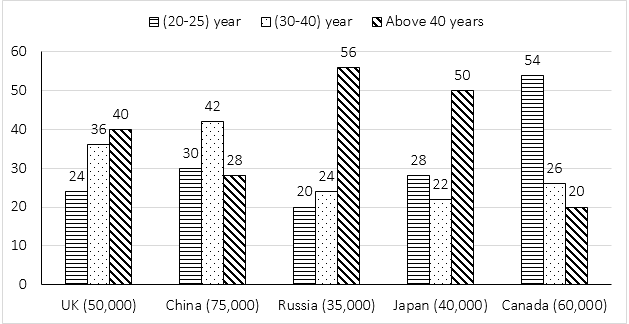 of foreigner tourists of age group (20-25) years from UK and Russia together is what percent more or less than the total no. of foreigner tourists of age group (20-25) years from China and Japan together who visited the Red fort (approximately)? Q8. Find the total no. of foreigner tourists of age group above 40 years who visited the Red fort from all the countries together. Q9. What is the ratio of no. of foreigner tourists of age group (30–40) years who visited the Red fort from China and Japan together to the total no. of foreigner tourists of same age group from Russia and Canada together who visited the Red fort? Q10. If 20% foreigner tourists from each country also visited the India gate then find the total no. of those foreigner tourists who visited only Red fort. Directions (11-15): What should come in place of question mark (?) in following number series? Q17. Train A starts its journey from Puri to New Delhi while train B starts from New Delhi to Puri. After crossing each other they finish their journey in 81 hours and 121 hours respectively. Then what will be speed of train B if train A speed is 44 km/h? Q19. Shatabdi Express crosses a platform and a bridge in 18 and 32 seconds respectively. The speed of the train and length of the train are 45 kmph and 140 metres respectively. Find the length of platform is approximately what percent less than the length of bridge? Q20. A cloth seller purchased 75 jeans at the price of Rs. 750 each and 80 shirts at the price Rs. 525 each, he spent Rs.3750 on transport of jeans and Rs. 2000 on transport of shirts and marked up jeans on 35% and shirt on 40% above cost price. At the time of selling if seller allows discount of 11 (1/9)% on jeans and 14 (2/7)% on shirts, find the overall profit percent of seller in this transaction? Directions (21-25): What should come in place of question mark (?) in the following questions? if x = y or no relation can be established between x and y. The pie-chart shows the percentage of employees working in four different companies and the bar-graph shows the percentage of employees promoted in these companies. Q31. What is the total number of promoted employees in Whirlpool and Ambuja together? Q32. What is the difference between the number of promoted employees in TATA and Ambuja together to the number of un-promoted employees working in Whirlpool and Indigo together? Q33. What is the ratio of the number of employees promoted in Ambuja & TATA together to the total number of employees working in Whirlpool? Q34. What is the average number of un-promoted employees from all the four companies together? Q35. 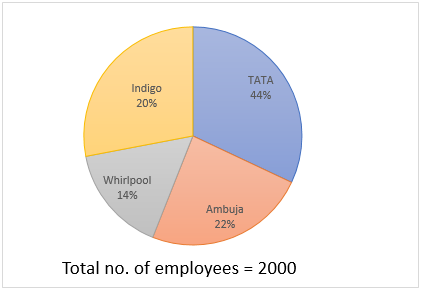 The number of promoted employees working in Indigo and Whirlpool together is approximately what percent of the total number of employees working in Ambuja and TATA together?